Set on a promontory just a short distance from one of the best-loved seas of Sardinia, Hotel Baia occupies a unique position on the coast of Chia, set amidst gleaming white beaches, dunes clothed in dense vegetation and lagoons coloured deep pink by the flamingos. The latest addition to Chia Laguna is an exceptionally fine hotel with a fresh, welcoming ambience, offering guests breath-taking views over the whole coast. The bar, restaurants, semi-Olympic pool, plus the nearby sports-dedicated area and the wellness centre Chia Natural Spa: each detail of Hotel Baia has been designed with the wellbeing and relaxation of its guests in mind. 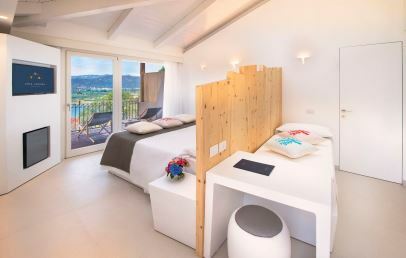 Set amidst Mediterranean brush growth, the hotel’s 80 rooms are welcoming and light-filled retreats, marked by their essential design; the dominant colour is white, both on the walls and on the wooden beams of the ceilings. The rooms are all located on the ground floor and have a patio and great view either over the beach or the garden. Suite Incanto – two double rooms (41 sq.m. + 53 sq.m. ), lounge (44 sq.m. ), three bathrooms, sea view. Suite – 50 sq.m., double bed, living area, a furnished patio, sea view. Prestige Mare – 26 sq.m., double bed, single sofa bed in masonry, a furnished patio, sea view. Prestige Laguna – 26 sq.m., double bed, single sofa bed in masonry, a furnished patio, lagoon view. Prestige Parco – 26 sq.m., double bed, single sofa bed in masonry, a furnished patio, park view. The hotel offers the possibility to book Prestige Laguna rooms with connecting door (upon availability). Sixty steps dug out of the rock separate the hotel from the splendid beach of Monte Cogoni, a long stretch of fine white sand. A stay at Hotel Baia includes beach services with the use of beach umbrellas and beach loungers. Guests staying at the Suite Incanto and Suite have the first row reserved. Guests staying in the Prestige Mare rooms have the second row reserved and guests staying in other room categories have free use from the third row. First and second row on the beach are upon availability and available with extra charge. Set in the central area of the resort, the Chia Natural Spa is dedicated to wellness: it offers the hotel’s adult guests an unforgettable multi-sensory trip with sauna, Turkish bath, emotional showers, treatments and rituals for face and body. Guests can use free of charge the fitness centre and also take part in group lessons of tennis, soccer, fitness and running. Additional activities are available with payment of a supplement: water sports and inland excursions, bicycle rental, use of the Chia Tennis Club facilities, five-a-side soccer pitches and, a short drive away, the Is Molas Golf Club. Stays at Hotel Baia are on a half-board basis. At the La Pergola restaurant, guests will be able to enjoy the best recipes of traditional Sardinian and Mediterranean cuisine, proposed in a mouth-watering buffet and with examples of show cooking. Before and after dinner, the stylish Whiteluna welcomes guests with gourmet snacks, sushi and live music. The Dine Around programme allows guests to choose each evening from one of the nine Chia Laguna restaurants (on request, with supplement). Guests of the Hotel can use the Baia swimming pool and take part in the sports activities organised by the resort and its external partners. A whole host of activities are available for discovery of the territory – nature treks, horse-riding, boat trips, guided tours, tours in quad and off-road vehicles. The large lounge area divides the Suite into two parts, each consisting of a double bedroom with its own lounge area and bath. 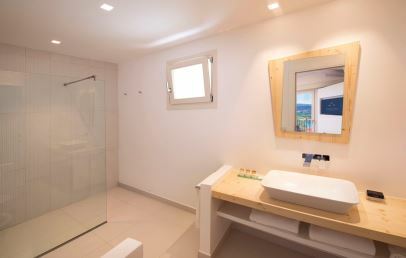 A third bathroom completes the Suite which opens onto an outdoor veranda and furnished relaxation area. Set amidst lush greenery, our Suite Incanto occupies an excellent position on the promontory and offers a great view over the sea and the lagoon. For guests staying in the Suites, is the first row at the beach reserved with sun umbrella and loungers. Large and luminous, the Suites are divided into a night zone with double bed and a day zone with a sofa bed. All rooms are set against a lush natural backdrop and have a furnished patio. The view is spectacular stretching to the horizon over the sea of Chia. 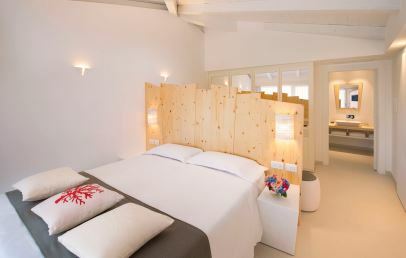 Welcoming and luminous, the Prestige Mare rooms are marked by their minimalist design, in which white dominates together with the rustic beamed ceilings. Rooms have a double bed and a single sofa bed in masonry. Set in lush greenery, Prestige Mare rooms have an external furnished patio and a splendid view over the sea. For guests staying in this room category is the second row at the beach reserved with sun umbrella and loungers. Welcoming and bright. The Prestige Laguna rooms are marked by their minimalist design, in which white dominates together with the rustic beamed ceilings. Rooms have a double bed and a single sofa bed in masonry. Set in lush greenery, Prestige Laguna rooms have an external furnished patio and a splendid view over the lagoon. Welcoming and luminous, the Prestige Parco rooms are marked by their minimalist design, in which white dominates together with the rustic beamed ceilings. Rooms have a double bed and a single sofa bed in masonry. Set in lush greenery, Prestige Parco rooms have an external furnished patio and a splendid view. Welcoming and luminous, the Prestige Laguna rooms are marked by their minimalist design, in which white dominates together with the rustic beamed ceilings. Rooms have a double bed and a single sofa bed in masonry. Set in lush greenery, Prestige Laguna rooms have an external furnished patio and a splendid view over the lagoon. Special Early Booking: 25% reduction for bookings confirmed within April 30th 2019 (stays from April 18th to May 31st)! Long Stay - Book at least 7 nights by April 30th 2019 and the last one is free of charge (stays from September 14th to October 12th)! Special Early Booking: 25% reduction for bookings confirmed within April 30th 2019 (stays from September 14th to October 12th)! Special Early Booking: 15% reduction for bookings confirmed within April 30th 2019 (stays from July 1st to August 16th and from August 27th to 31st!)! Special Early Booking: 15% reduction for bookings confirmed within April 30th 2019 (stays from July 1st to August 16th and from August 27th to 31st)! Special Early Booking: 20% reduction for bookings confirmed within April 30th 2019 (stays from June 1st to 30th)! Special Early Booking - partially Not Refundable: 25% reduction for bookings confirmed within April 30th 2019 (stays from June 1st to August 16th and from August 27th to 31st)! 25% of the total amount of the reservation is not refundable. Special Early Booking - partially Not Refundable: 25% reduction for bookings confirmed within April 30th 2019 (stays from July 1st to August 16th and from August 27th to 31st)! 25% of the total amount of the reservation is not refundable. For customers staying in a Suite Incanto or Suite: beach service in the first row included. For customers staying in the Prestige Mare rooms: beach service in the second row included.